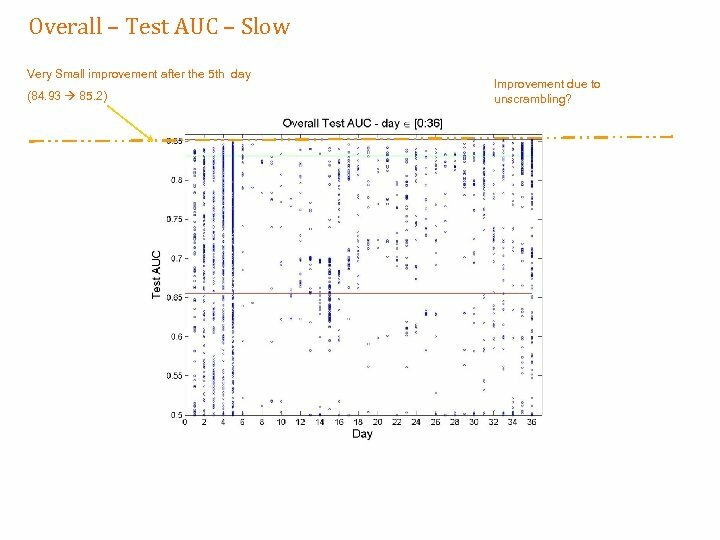 Overall – Test AUC – Slow Very Small improvement after the 5 th day (84. 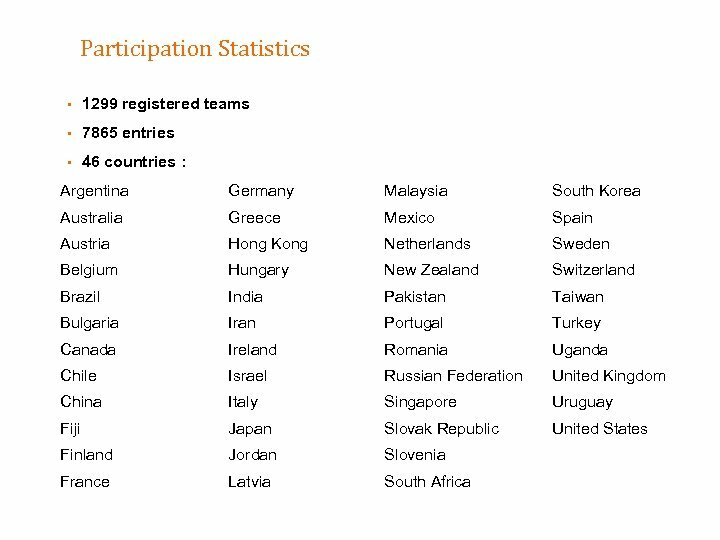 93 85. 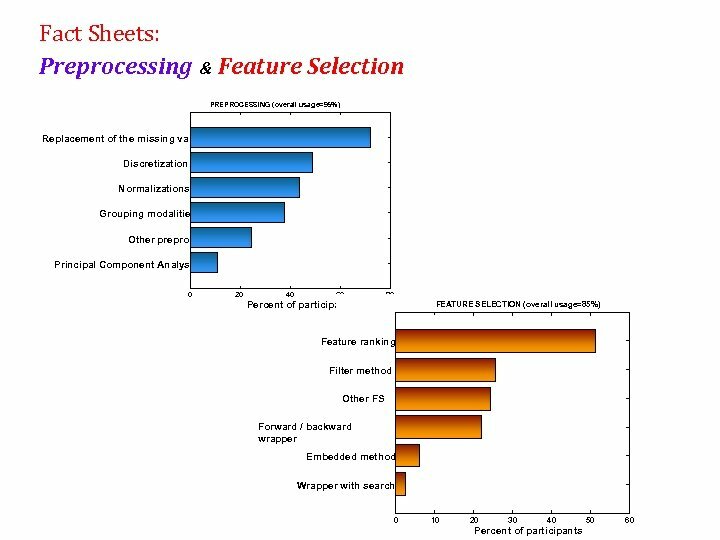 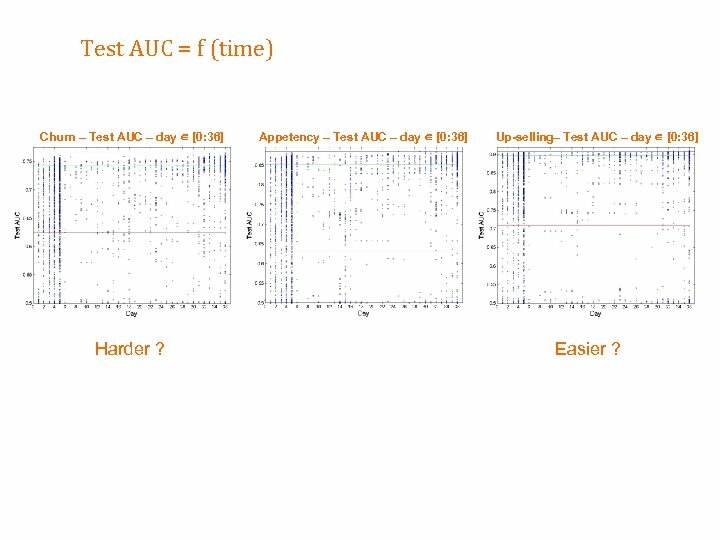 2) Improvement due to unscrambling? 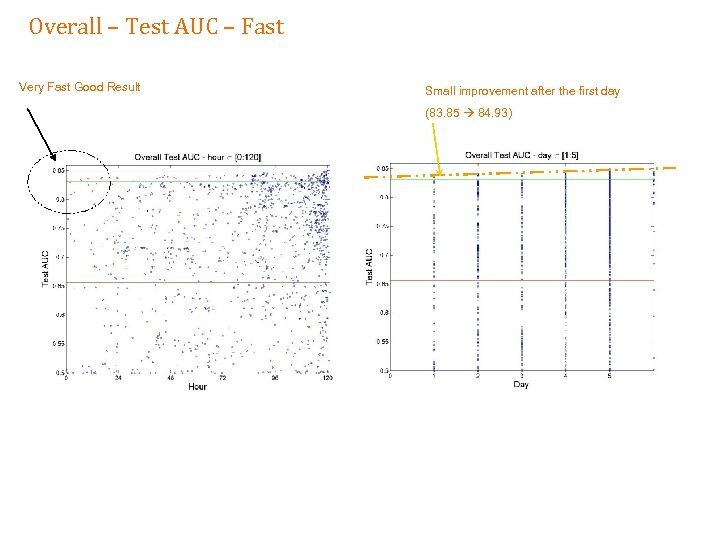 Test AUC = f (time) Churn – Test AUC – day [0: 36] Harder ? 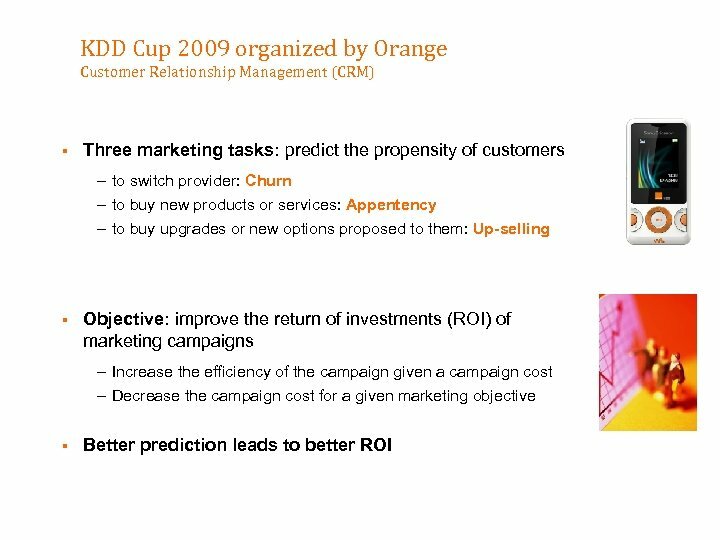 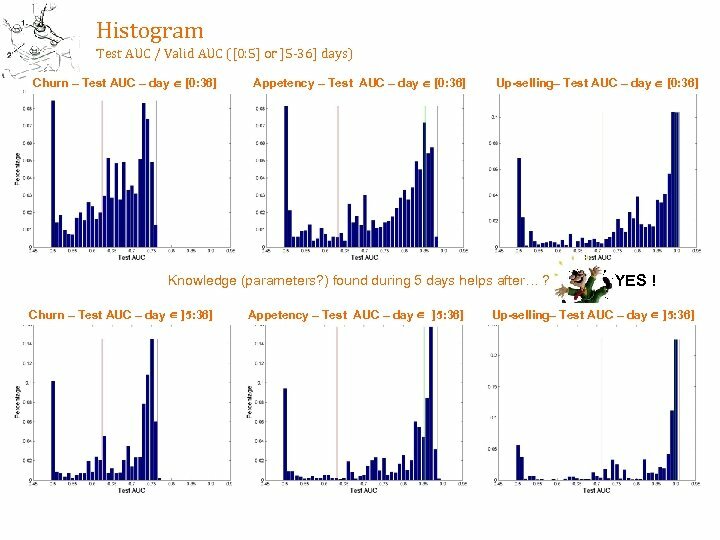 Appetency – Test AUC – day [0: 36] Up-selling– Test AUC – day [0: 36] Easier ? 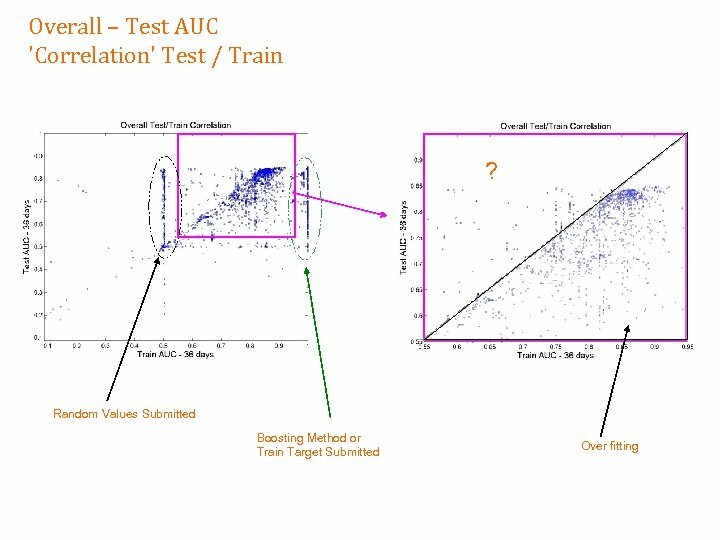 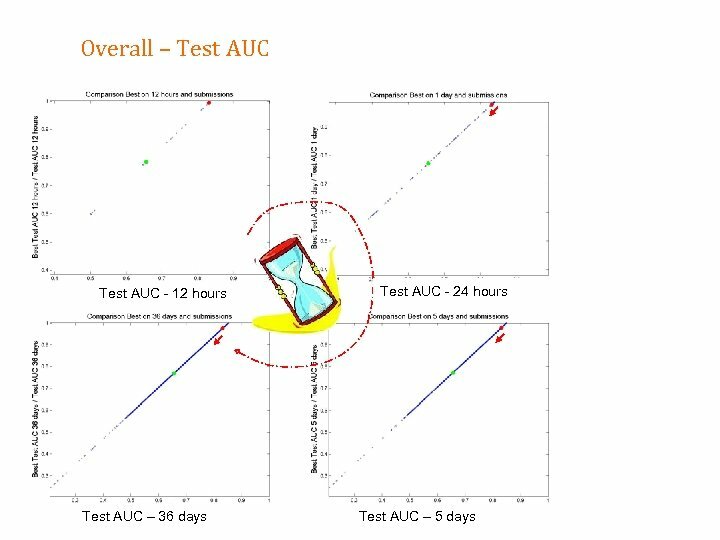 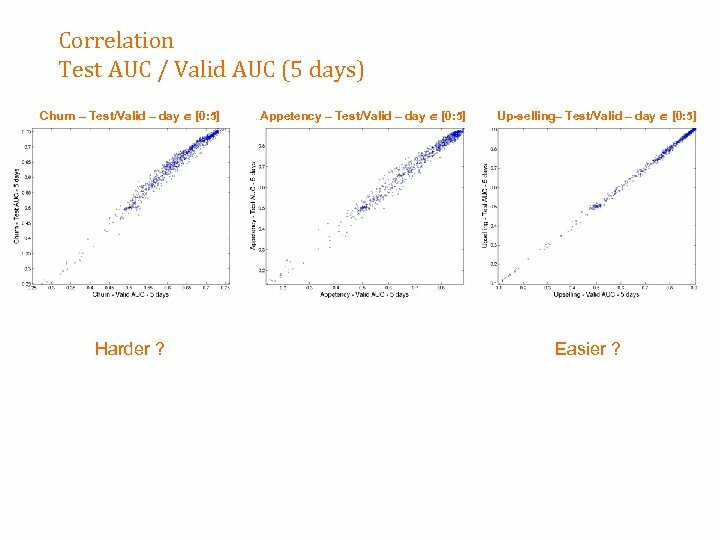 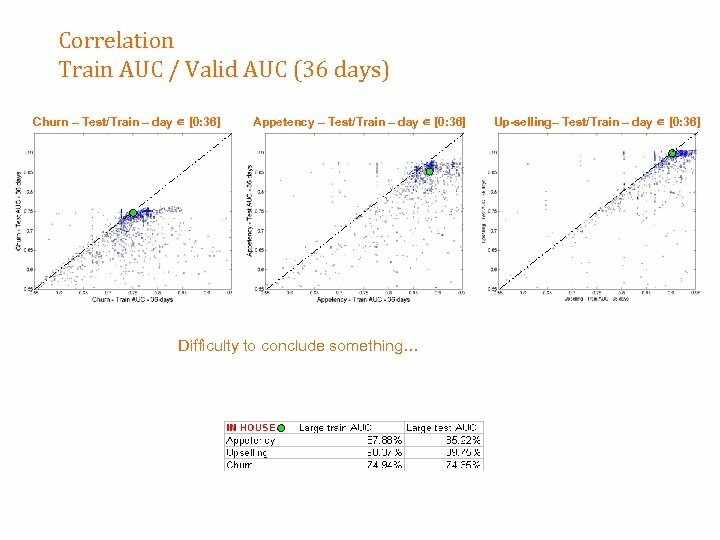 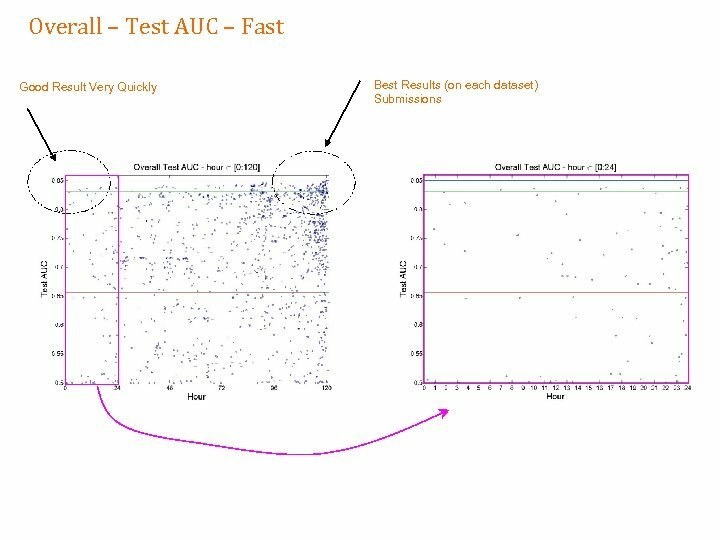 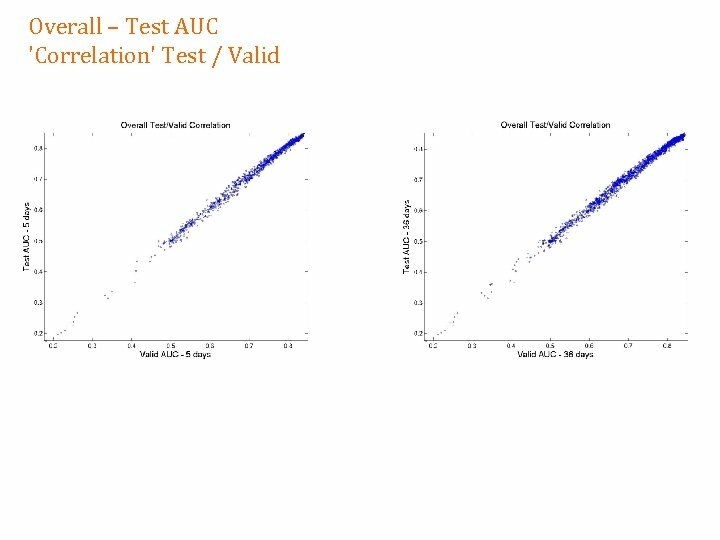 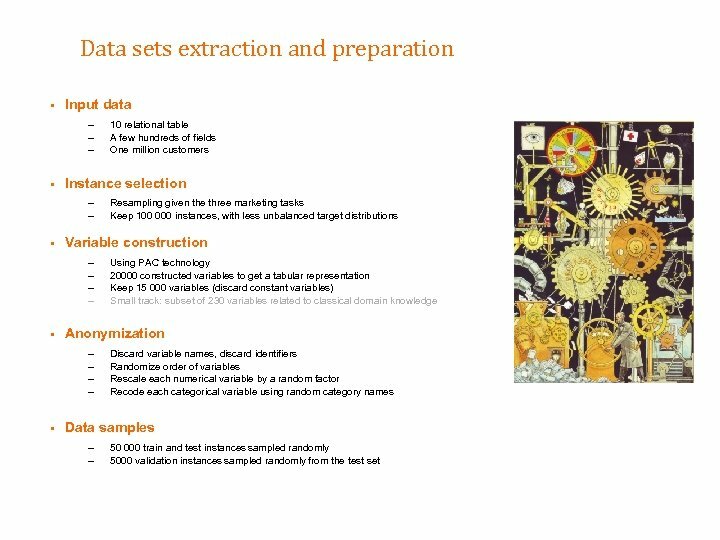 Correlation Test AUC / Valid AUC (5 days) Churn – Test/Valid – day [0: 5] Harder ? 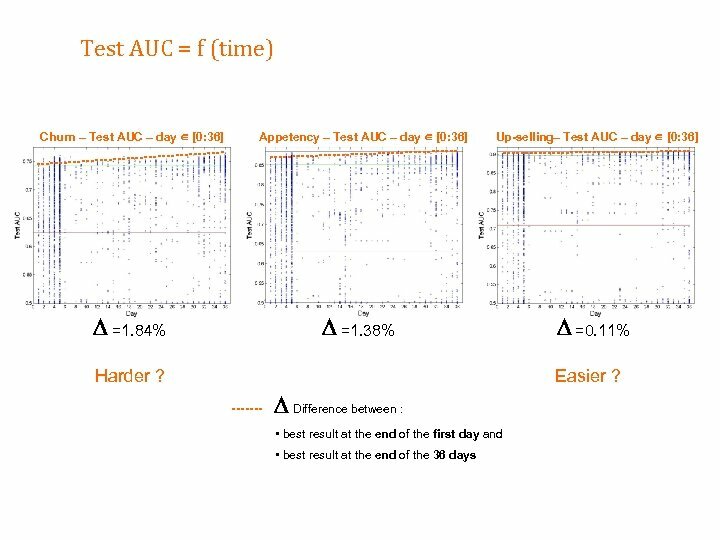 Appetency – Test/Valid – day [0: 5] Up-selling– Test/Valid – day [0: 5] Easier ? 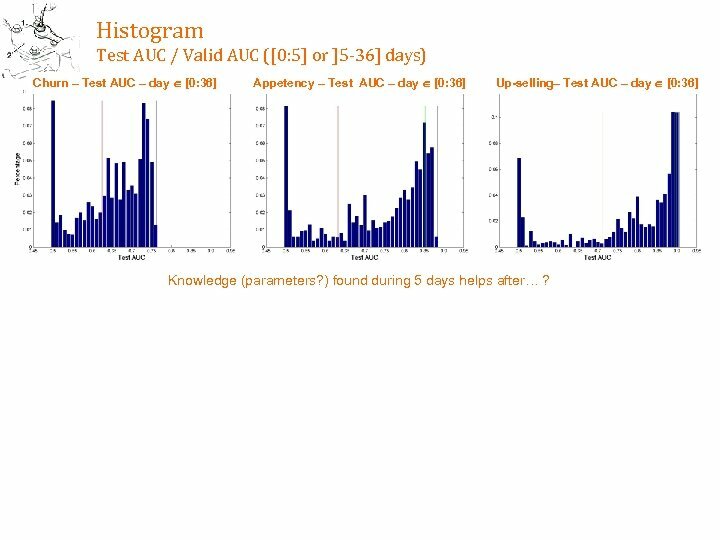 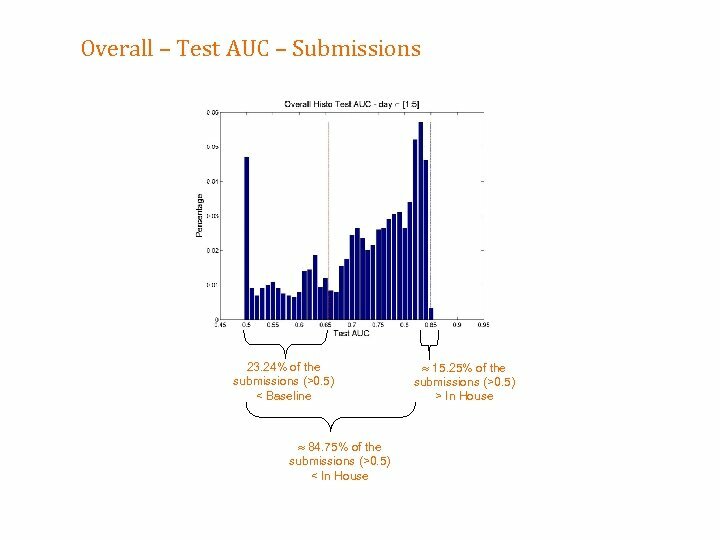 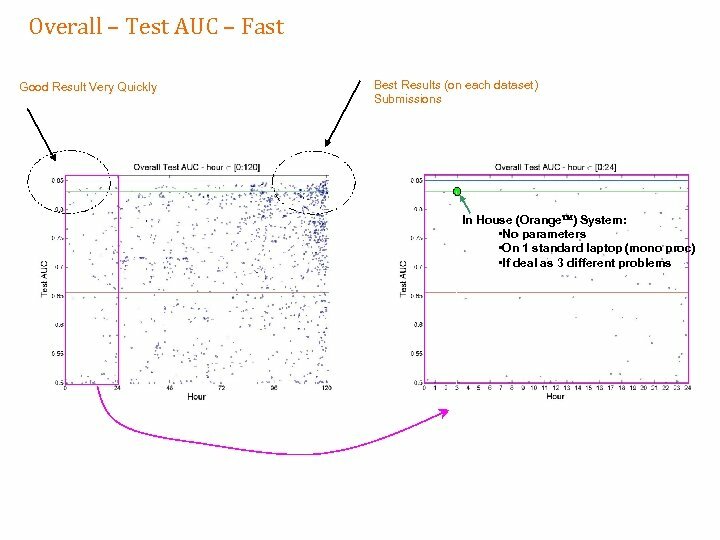 Histogram Test AUC / Valid AUC ([0: 5] or ]5 -36] days) Churn – Test AUC – day [0: 36] Appetency – Test AUC – day [0: 36] Up-selling– Test AUC – day [0: 36] Knowledge (parameters? ) 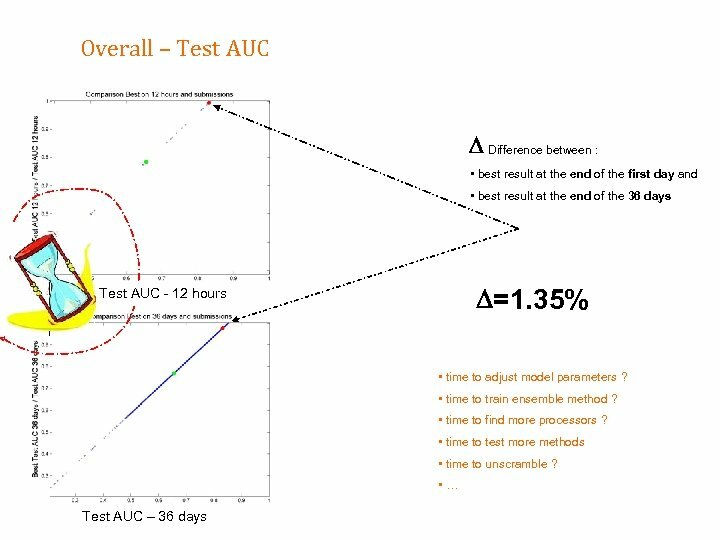 found during 5 days helps after… ? 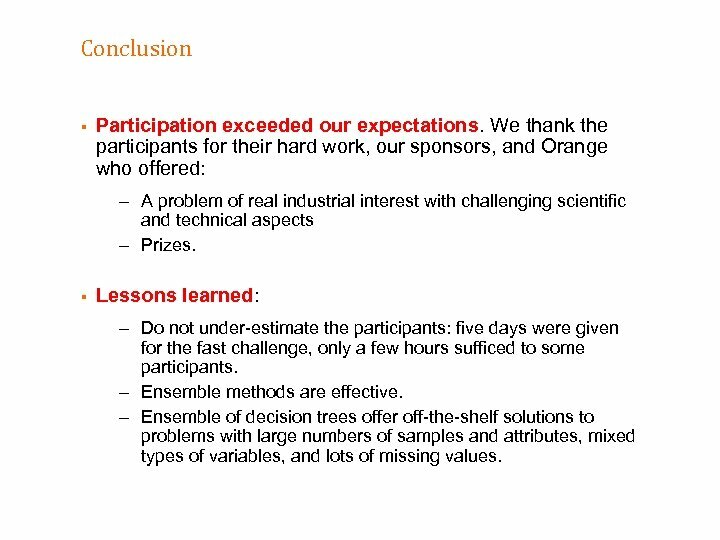 Conclusion § Participation exceeded our expectations. 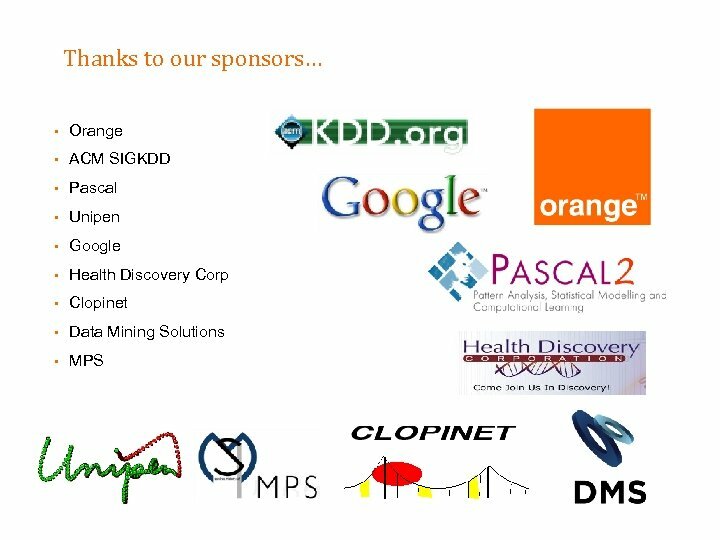 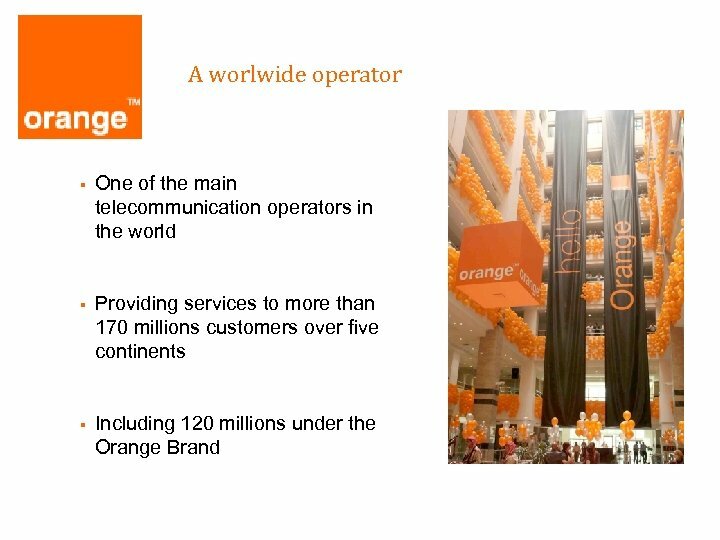 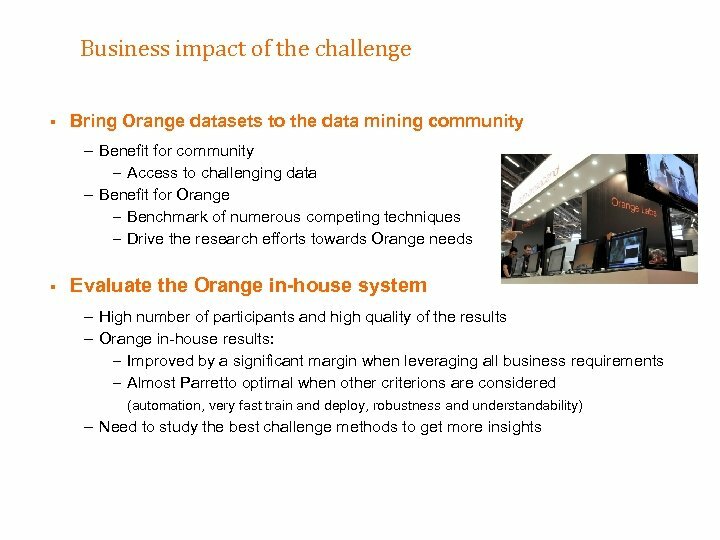 We thank the participants for their hard work, our sponsors, and Orange who offered: – A problem of real industrial interest with challenging scientific and technical aspects – Prizes. 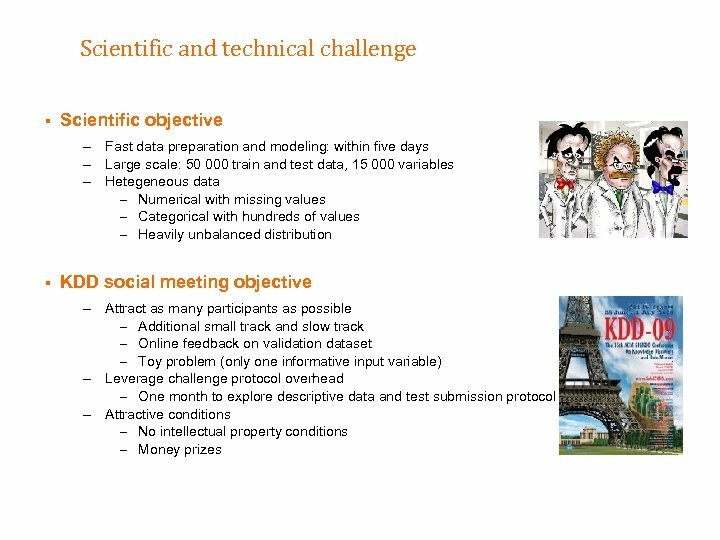 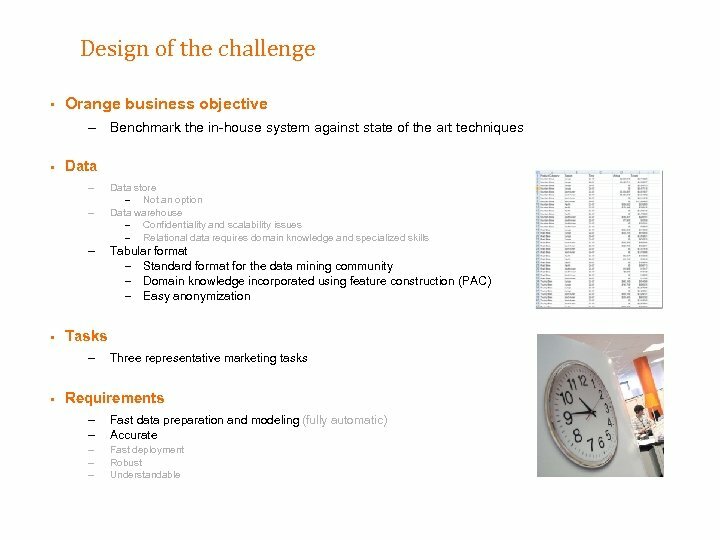 § Lessons learned: – Do not under-estimate the participants: five days were given for the fast challenge, only a few hours sufficed to some participants. 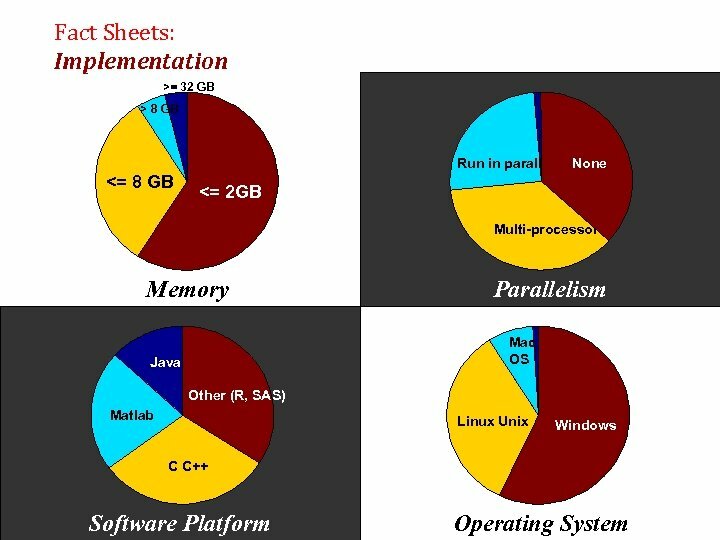 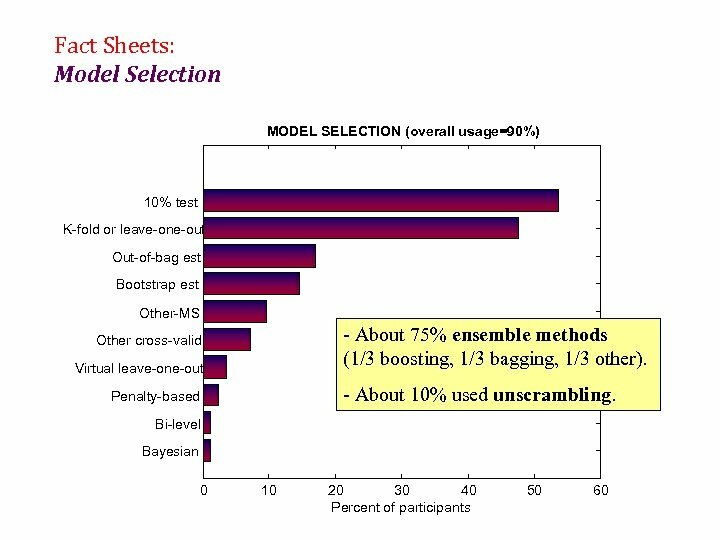 – Ensemble methods are effective. 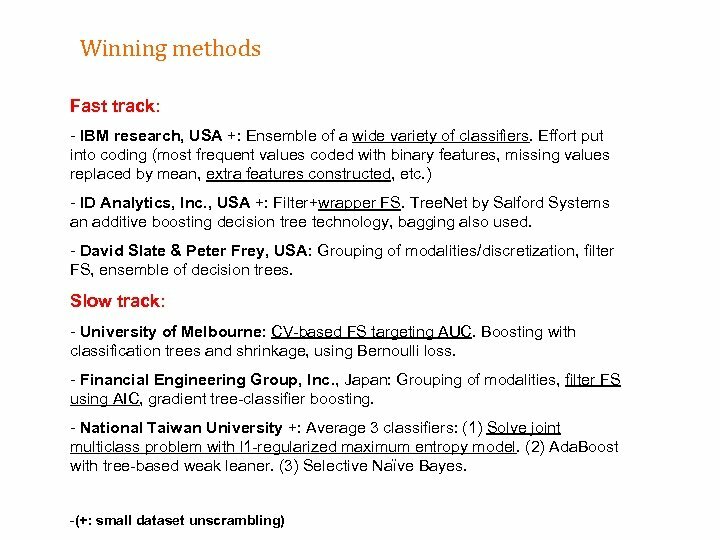 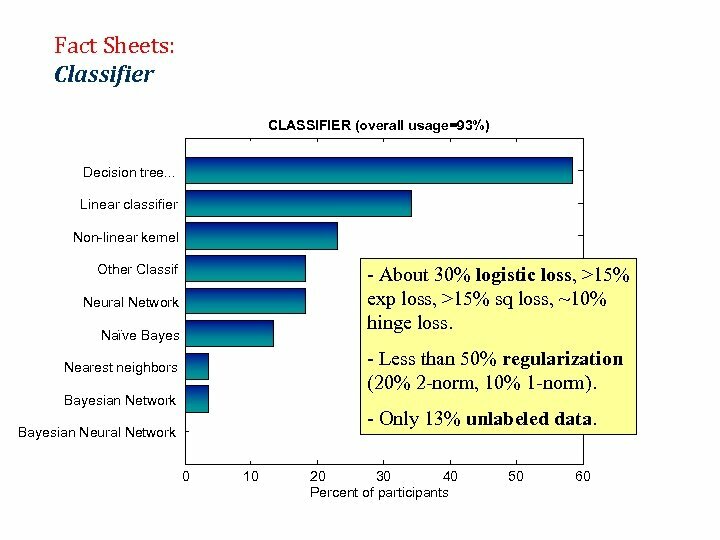 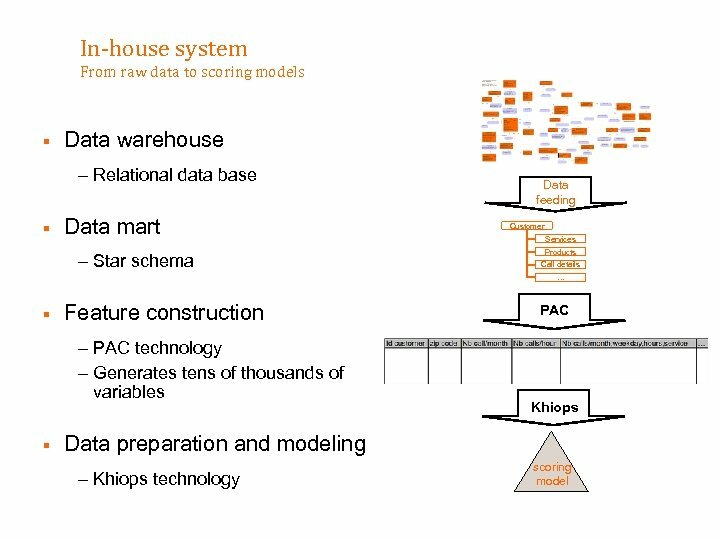 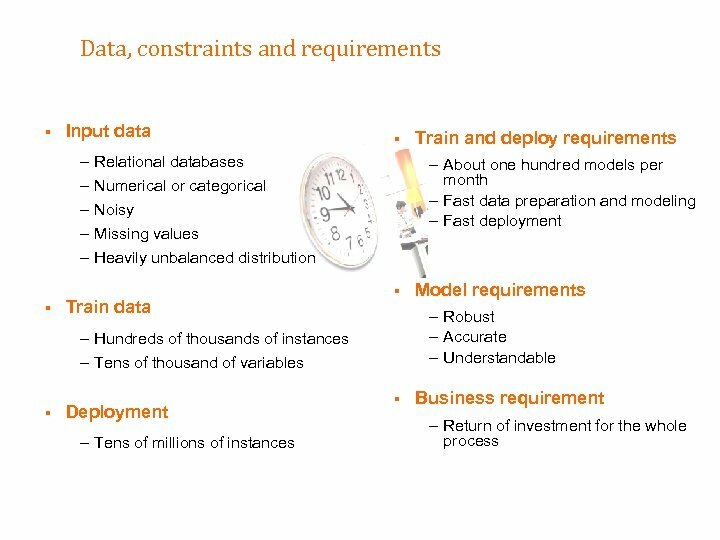 – Ensemble of decision trees offer off-the-shelf solutions to problems with large numbers of samples and attributes, mixed types of variables, and lots of missing values.